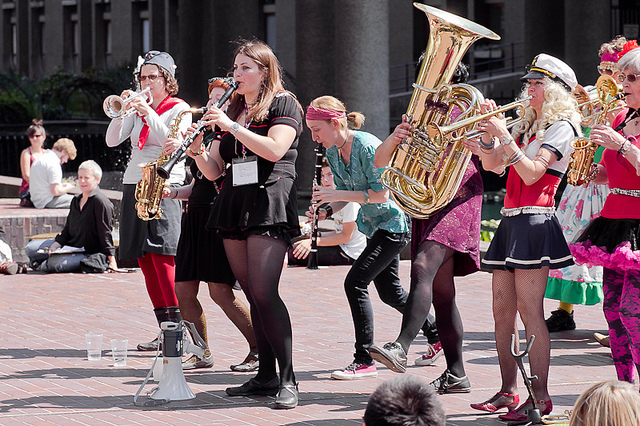 Recently we did an article on where to learn brass instruments in London, and it unearthed an unexpected set of people keen to try their hand at being a member of a big band. By that we obviously mean the type of jazz and swing-style brass, woodwind and percussion troupes who make a decidedly big sound, rather than big in the 'successful' sense. So if you're looking for a quick route to the top of the charts you've come to the wrong place, sorry. Here are a few of London's big bands that are currently accepting new members or holding auditions. As ever, if you know of a particularly fabulous big band that we've missed out, please let everybody know in the comments below. There are quite a few 'concert bands' around playing more classical material that also throw out the odd big band number or two, but for now we've tried to concentrate on the 'big bands' playing mostly the more showy numbers. Though they try to pigeonhole themselves with their name, the South London Jazz Orchestra say they are about much more than just jazz. Their goal is to promote the big band format in the community and have as much fun as possible while doing so, though it's not restricted to south London as they have played such far-flung venues as the 100 Club on Oxford Street. They do not hold specific auditions and there are no restrictions to joining as they find that keen and committed players find their own level at which to contribute. Membership is by subscription, and training is available for those keen to up their level. The Duke Street Big Band are in fact based all over the place, but they hold their rehearsals in King's Cross each Tuesday evening. They have a large number of saxophone players so you can imagine that they must put on quite a show given the raucous nature of that particular instrument. They're a tight outfit though, and you'll need to have reached a standard of Grade 8 on your instrument and have some experience of playing in a big band before you'll be allowed in. If you get in touch via their website they'll invite you to a rehearsal if they have a slot free, and add you to their waiting list if not. Membership fees are a fiver a week. Jazz, swing, funk, Latin — so says the website of this community big band based in Leytonstone. John Ongom is the band leader of this collective who play tunes by the likes of Count Basie, Bobby Darin and Ella Fitzgerald, and they are currently looking for trombone players to add to their ranks. They are also happy to hear from non-trombonists who feel they may have something to offer. Ongom's band hold their rehearsals on Thursdays evenings, and they're available for hire (as, in fact, are most of the bands in this list). Out in the far reaches of Hillingdon (if it happens to be a Sunday) you can hear the enormous sounds of Sammy Nestico. That's where and when the Stardust Big Band have been holding their rehearsals at the Harefield Community Centre for the last six years, and if you're a competent player of Ellington, Basie and the like, you may just fit right in. They're always on the lookout for great new musicians and claim to be a relaxed and fun outfit, so get in touch with them via the website if you fancy turning your instrument to hits like Sing Sing Sing by Benny Goodman and Begin the Beguine by Artie Shaw. 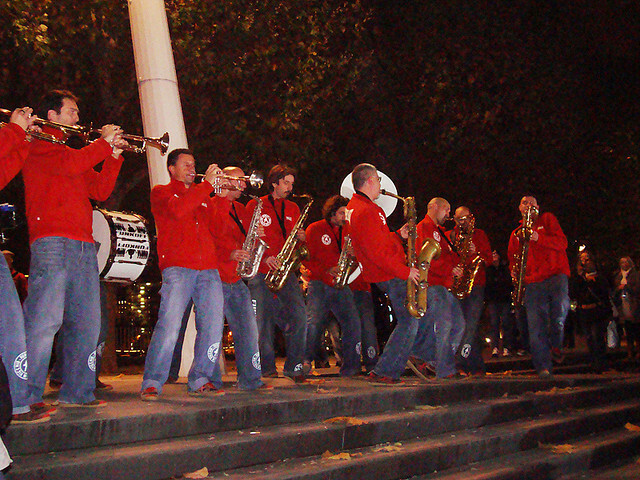 The East London Community Band have a number of bands they run concurrently, as they attempt to match the level of newcomers with others already involved. They range from the Premier Band, which is premier in the sense that it's the first band you'll join when you've reached the minimum level of competency, all the way up to their Advanced Band, for serious musicians. Each has a repertoire from film music and big band tunes to popular classics in other genres. The bands meet at the Shadwell Centre by The Highway in E1, though obviously at different times, therefore you'll want to check the website for the next time your particular group is meeting (though it would be wise to get in touch first before rocking up). A bit of a cheat in that it's not specifically a 'big band', but a traditional brass brand. Still, the Crystal Palace Band are on the lookout for new members and we did start all this with brass, so we thought we'd have them here, in case a proper brass band is exactly what you've been waiting for. The Band is one of a lessening number of traditional brass bands still playing regularly in the capital. In addition to their main band they have a 'progress' band, which allows for the development of new members of all ages and abilities. The progress band meets for rehearsals on Wednesdays at The Crystal Palace Museum and if you fancy yourself as something of a flugelhorn hero, this could be right up your alley. Let us know in the comments if you know of any more specifically 'big bands' in London, or of course if you think we should cover the 'concert bands' too.